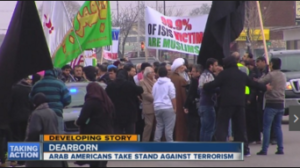 Muslim residents of Dearborn demonstrate against terrorism. Both Dearborn in Michigan and Molenbeek in Brussels, Belgium, are strongly Muslim communities. However, there the similarities end. Molenbeek is a community in despair, whose residents have found it impossible to assimilate into Belgian society. Most of them have experienced job discrimination and other forms of prejudice. Unemployment and poverty are high. Trust of law enforcement is low. Hopelessness predominates. It should not be surprising that from this one ghetto both the Paris and Brussels terrorist attacks were launched. Nothing can justify such violent acts, but it is not hard to understand them. Some of our political and media people think that every Muslim community is another Molenbeek. In fact, Dearborn is nothing like that at all. Nearly a third of its 95,000 residents are Arab-American or of Arab descent, but compared with the alienated Muslim underclass in France or Belgium, its residents are far more assimilated and patriotic. Dearborn has the country’s largest mosque, an Arab Museum, Middle Eastern cafes, and halal (lawful for Muslims) beef burgers at the local McDonald’s. When Dearborn’s chief of police, Ron Haddad travels, he says, “Someone will come up to me and put their finger in my face, and they’re already angry,” he says. “They say, ‘Will the people in your community report acts of terror to you?’” He replies, “Not only would they, they do,” he says. “They’ve done it.” Why are these two communities so different? The difference is in the way the Muslim residents of this community have been treated. Haddad’s police force has led the way in massive outreach to that community. There is an annual awards ceremony for people who have reported crime. “At least twice in the past several years, fearing influence from ISIL or online propaganda on their children, Muslim fathers have turned in their own sons. In another case, it was students at a largely Muslim high school calling about a troubled peer.” This outreach program has become a model for law enforcement agencies throughout the USA. Haddad’s placement of informants throughout the community is more controversial. They listen for rumors and possible defections and are prepared to intervene quickly. This doesn’t seem to bother the local residents because of the good will shown by the Dearborn police. They and the community are on the same side in this effort to prevent Dearborn from becoming a center of jihadist rhetoric. Authorities also have evidence now that to punish wayward young people is less effective than to engage them and “off-ramp” them into a more constructive approach to their lives. In Dearborn the FBI has dropped the use of “sting” operations, in which people are set up for a crime and then arrested when the start to do it. It has been found that this kind of entrapment causes resentment in the community and actually creates terrorists out of people who might not have gone that far apart from their encouragement. This approach is being proven to work. “‘I can say unequivocally that in 10-plus years of my work in the federal government, Arab Muslim and South Asian communities across this country have become one of the greatest resources of protecting homeland security and promoting American values at the same time,’ says George Selim, the Department of Homeland security official who is taking charge of the new task force [to implement this approach more widely. Michael Hirsh, “The FBI’s Secret Muslim Network,” Politico, March 24, 2016, http://www.politico.com/magazine/story/2016/03/fbi-muslim-outreach-terrorism-213765#ixzz45lG8F1wG, last viewed 4/13/16. This entry was posted in What's New and tagged American Muslims, counterterrorism, Dearborn, Molenbeek. Bookmark the permalink.